The early hospitals in Kent on the South Bank of the Thames estuary, civilian and military, were not on land, care for patients being offered on board obsolete warships of the Royal Navy. At Chatham, HMS Argonaut was declared obsolete in 1799, and in 1810 was fitted out as a floating hospital. It continued in use until 1828 when its patients were treated in the newly built Melville Hospital which cared for seamen, marines and their families until the centennial year of Trafalgar, 1905 when RNH Chatham was opened by King Edward VII. Earlier in 1883, the first of several ‘hospitals’ upstream of Gravesend and below where the Darent enters the Thames – HMS Atlas a 90 gun vessel and the 50 gun frigate HMS Endymion were fitted out as hospitals and moored at Long Reach, off the Dartford Marshes. ‘Castalia’ a cross channel ferry joined them as did two paddle steamers fitted as ambulance ships. A pier was erected connecting with land purchased to provide a laundry, engine rooms and staff accommodation. These were initiatives of the Metropolitan Asylums Board which finally decided that permanent land accommodation was essential: a smallpox hospital was built at Long Reach and in the 1890’s a permanent convalescent hospital of ten 100 bedded blocks was built inland of Dartford at Darenth Woods. This became, when the Metropolitan Asylums Board was superseded by the London County Council, the Southern Hospital – of considerable size, eventually 160 acres accommodating 1700 beds, not including the open air hospital for children, built just before the Second World War but never completed. The Southern Hospital came into prominence at this time. At the Munich Crisis in 1938 when the Prime Minister Chamberlain went to see Adolph Hitler, war with Germany seeing to be imminent, the Royal Naval Hospital, Chatham was evacuated to the Southern, clearly anticipating invasion. Conflict did not immediately materialise; RNH returned to Chatham, but events moved swiftly in the next year finally leading to Great Britain’s declaration of war with Germany in 1939. The Southern Hospital was put on a wartime footing as a grade one Emergency Medical Service Hospital and it received as its Medical Superintendent Robert Henderson who had been Principle Assistant in the Public Health Department for the London County Council (LCC). He was given the rank of Surgeon Captain RNVR and a 400 bed unit was reserved within the civilian hospital for armed service patients, mainly from the Royal Navy. When the British Expeditionary Force withdrew from Dunkirk it admitted a greater number of casualties then any other hospital. Henderson was a distinguished physician who had been instrumental in the development from an American design of the first British ‘Iron Lung’, the Henderson Respirator. As it was known that tuberculosis was the scourge of the Royal navy, his appointment was timely and apt. The extent of the Southern Hospital’s grounds, in a fold of the Darenth Woods at a high point overlooking the Darent Valley, on the northernmost height of the Kentish Weald made it possible to create a sanatorium-like convalescence and rehabilitation centre not unlike the Swiss Alpine hospital described by Thomas Mann in his book ‘The Magic Mountain’. From 1940 and throughout the war Henderson reported both to the LCC and the Surgeon Rear Admiral at the RNH Chatham, directing both civilian and the military who comprised his staff – as far is known, a unique achievement. His heads of function included head of surgery and physicians, a civilian Matron, a Commandant of Red Cross VAD nurses aides, a Naval Office of two Wardmaster Lieutenants, a Sick Berth Petty Officer and Sick Berth Attendants. Reporting directly to him was an Instructor Lieutenant and Education Vocational Instructors of Leading Rate, occupying an office of Education and Rehabilitation Department. There was an Army Office which was also responsible for patients from the RAF. The operating theatre was staffed by civilian doctors and nurses; the administration department – Engineering, Catering, Transport, Farm and Estate Management, Maintenance and the Office were all civilian. The professions supplementary to medicine – Physiotherapy, Occupational Therapy, Remedial Gymnastics, and the Red Cross and St Johns Library were staffed by civilians, though the publications of the Army Bureau of Current Affairs were housed and administered from the information room in the Education Department. A high proportion of staff from all ranks were resident in the hospital grounds so making it very neatly self sufficient in the winter freezes which Kent traditionally experiences, especially on its higher ground. In the severe winter if 1947 the hospital was cut off for several days at a time. 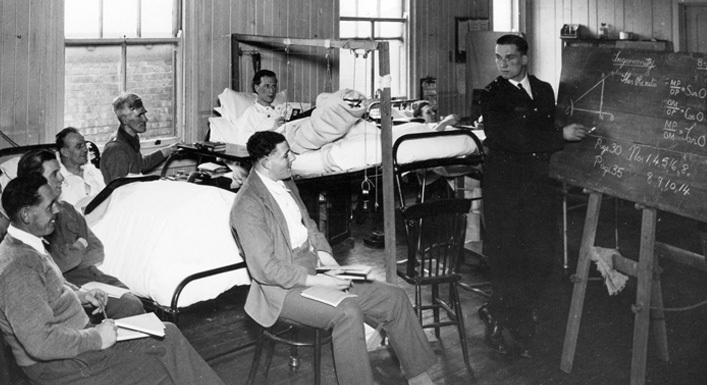 The purpose of the Southern Hospital from 1940 was clear – to receive patients, to treat them if necessary by surgery and to provide after care of rehabilitation and to resettle them before discharge. March 2007 for “DOC RN” The Magazine of the Royal Naval Medical Branch Ratings and Sick Berth Medical Attendants.